> Win four premium oil servicing packages worth a total of $1,100! Win four premium oil servicing packages worth a total of $1,100! 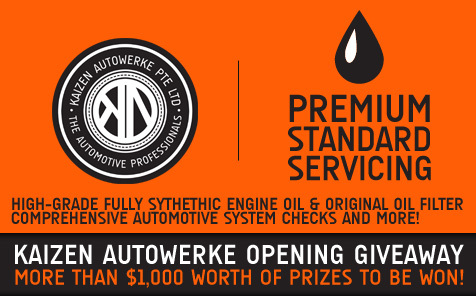 Kaizen Autowerke Giveaway - Win four premium oil servicing packages worth a total of $1,100! Take part in our sgCarMart contest by answering questions about Kaizen Autowerke in the month of May and stand a chance to win attractive prizes worth up to $1,100. Hurry and Grab your favourite deals today! Quote SGCARMART PROMOTION to the retailer. The metallisation of the Titan series uses ground breaking Sputtering process, applying Titanium as its main element together with a combination of other exotic metals such as copper, gold, silver, inconel, chromium and aluminum to achieve its amazing heat rejection properties. The Titan series exudes a cool neutral grey tone, exclusively available for Titan users. The application of Titan films on your vehicle will further enhance the luxurious contrast of your interior. Definitely a must on any luxury automobile! Package includes 4litre engine oil, oil filter, checking of tyres and battery, brakes service, 37 detailed points check and car wash! All workmanship comes with 3-6 months warranty. Promo limited to 2 cars per day only, please call us in advance. 2 Way Component Speaker From $150! You One-Stop Shop! Aircon repair, USA solar film, sticker wrapping, alarm, audio system, gauges, Amaron battery, side mirror folding mechanism repair and many more. Lanzar USA, Pioneer Japan, Rockford, Rainbow Germany.